In this era of minimally-invasive procedures for diagnosis, prognosis and treatment decisions, pathologists are often the “first responders” analyzing and triaging limited specimens, including aspirates and small biopsies, and are continuously asked to make more specific diagnoses from those smaller samples. Clinicians increasingly request information regarding specific classification of the malignant tumors, and in many cases, application of additional prognostic and therapeutic markers to help guide their management. Although morphology remains the cornerstone of cytology and histology, ancillary studies can confirm and/or subclassify a malignancy in many cases; and although most pathologists recognize the crucial role of ancillary testing, it can be extremely frustrating for many of us to keep up with new advances and rapidly growing developments in the fields of immunohistochemistry and molecular techniques. There exists abundant literature describing new antibodies and molecular tests and panels, but it can be especially overwhelming to decipher which tests are actually most practical in the workup of a specific neoplasm or clinical presentation. For these reasons, one of the purposes of this course is to present the efficient utilization of these ancillary studies based on differential diagnoses generated by the cytologic and/or histologic evaluation. 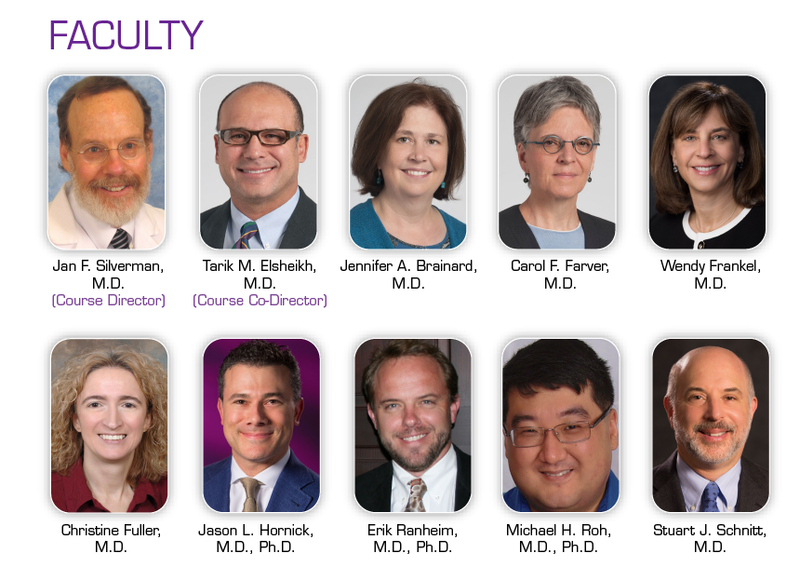 In this long course, we gathered some of the top experts in their fields to discuss their strategies and most practical approaches to maximizing the information gained from limited specimens from a variety of organs, including lung, colon, soft tissue, brain, breast, metastases of unknown primary origin and hematologic specimens. Diagnostic challenges and potential pitfalls associated with limited specimens will be highlighted, and importantly, discuss which of the ancillary tests are more practical. This approach is of critical importance in helping the pathologist to serve as the gatekeeper for preserving tissue adequacy and becoming most efficient in triaging such specimens. The United States and Canadian Academy of Pathology designates this enduring material for a maximum of 5 AMA PRA Category 1 CreditsTM. Physicians should claim only the credit commensurate with the extent of their participation in the activity. The USCAP is approved by the American Board of Pathology (ABP) to offer Self-Assessment credits (SAMs) for the purpose of meeting the ABP requirements for Continuous Certification (CC). Registrants must take and pass the post-test in order to claim SAMs credit. Physicians can earn a maximum of 5 SAM credit hours. The following faculty reported no relevant financial relationships: Jan F. Silverman, M.D., Tarik M. Elsheikh, M.D., Jennifer A. Brainard, M.D., Carol F. Farver, M.D., Wendy Frankel, M.D., Christine Fuller, M.D., Jason L. Hornick, M.D., Ph.D., Erik Ranheim, M.D., Ph.D., Michael H. Roh, M.D., Ph.D., Stuart J. Schnitt, M.D. Buy the entire 2018 Annual Meeting Long Course and get a great discount!